The official Top #25 countdown will begin on Thursday, December 7th, as we’re going to close out the last 25 days of 2017 with the Top 25 cards. We’re kicking things off early with a few honorable mentions. 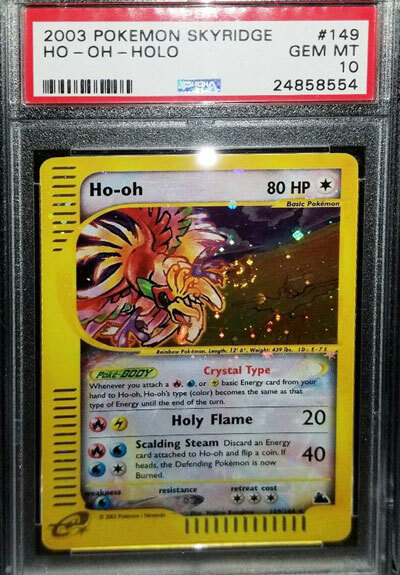 In October 2017, this copy of Ho-oh sold for $1835.00. This is a secret rare in 2003’s Skyridge expansion. This was the last Pokemon TCG set ever produced by Wizards of the Coast. After this set, the Pokemon TCG license went back to Nintendo. There are six crystal Pokemon in the Skyridge expansion: Celebi, Charizard, Crobat, Golem, Ho-Oh, and Kabutops. All six are rare, hard to find, and extremely valuable. After the $1835 sale, the next highest priced copy sold for $1675 in October 2017 as well. Some quick notes on our rankings: These are all cards you can reasonably collect. These are all cards that were available in the United States. These are cards that appeared in Booster Boxes, Booster packs, and/or Starter Sets. Typical Pokémon fans could have plausibly obtained these cards through auctions, trades and/or blind luck pulls. There are no cards in our list that were given out as prizes for winning contests. All values are based on actual sales of Pokemon Cards on eBay during the 4th quarter of 2017. Our Prices are based on Professionally-Graded, Gem Mint cards, which are independently certified of their condition. Here’s an article on Graded Pokemon Cards if you don’t know what Graded Cards are.